4 metre long x 1.1 metre wide of 25g Ultra Lightweight Glass Fibre Woven Cloth. 4 metre long x 1.1 metre wide of 49g Super Lightweight Glass Fibre Woven Cloth. 520g of Bucks-Single Part Coating System (Gloss or Semi-Matt Finish). 1 Bucks Synthetic Coating Brush 1"
1 coating Squeegee applicator card. 1 pair of Surgical Gloves. Foam Friendly, single-part no mixing required, dries hard & clear. Self Levelling Properties and very long working time. Makes a good ding resistance surface on models. Full strength is in 4 weeks. Low Odour & easy to use. 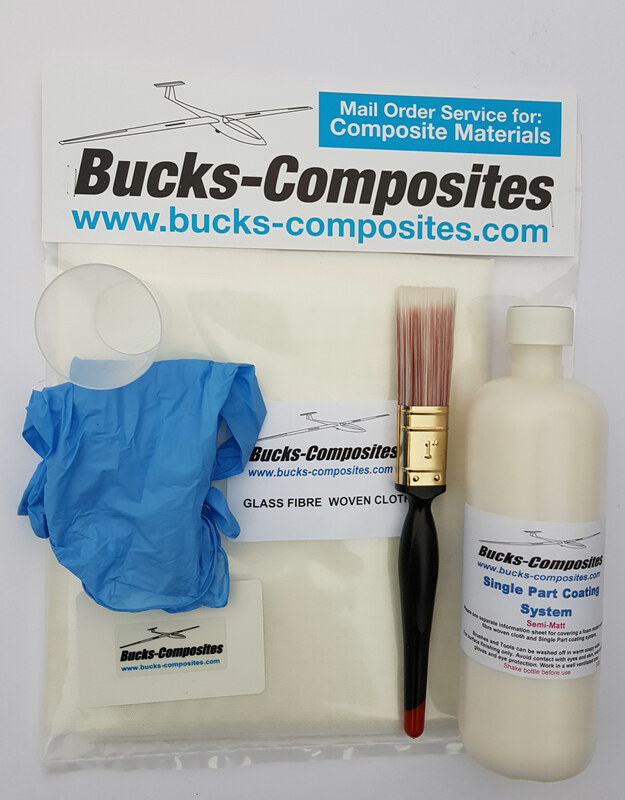 If covering a foam surface, sand the foam smooth then cut the glass fibre woven cloth to size and lay on the foam surface then wet out the cloth with single-part coating system with a Bucks coating brush and leave for 2 hours to dry before applying a further three coats with 2 hours drying time between coats. The brush when used with Bucks Single-Part Coating System can be easily cleaned with warm soapy water. Please select glass fibre woven cloth weights: 25g (1.1 metre wide) or 49g (1.1 metre wide) & finish from the menu below.